13 years ago, the date of September 11th took on a whole new meaning. The tragedy that took place that day will forever be in our minds. In order to honor those who lost their lives that day and in the war that followed, members of the house placed these flags on the front lawn. 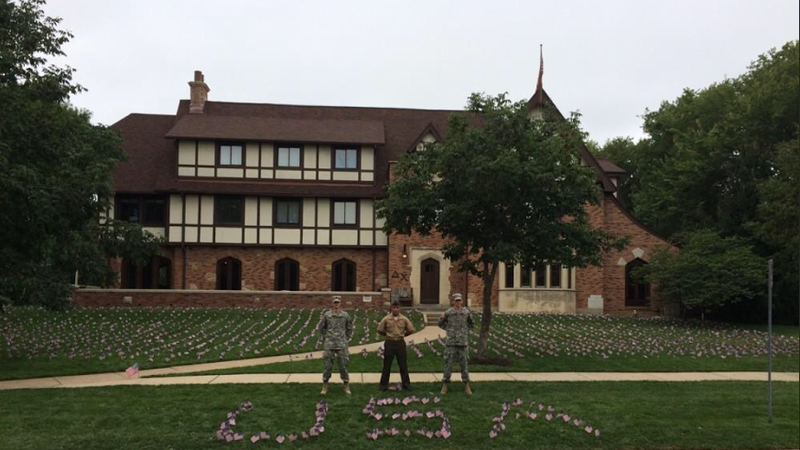 2,977 lives were lost that day, so Delta Chi set up exactly 2,977 flags in their solemn commemoration. Brother Stephen Blank (far left) and Associate Members Dan Kashini (middle) and Danny Rich (far right) serve in the military and proudly represent their country. Stephen Blank and Danny Rich are both Cadets in the Army, and Dan Kashini is a Private in the Marines. Delta Chi started this annual tradition of setting up the flags three years ago, and the members are excited to carry the tradition on for many years to come.